Unfortunately, pain is a necessary part of any MCL surgery recovery. It is a side effect of the body's natural response to the tissue damage that occurs before and during surgery. Fortunately, there are ways to reduce this pain, both with medication and without. If you want to minimize the amount of pain you are likely to experience, it is important to follow all of your doctor's recommendations for recovery. Introducing cold compression therapy shortly after surgery can also help reduce the amount of pain you will experience. MCL Surgery: Why is it Painful? When your body suffers a trauma, whether it is a blow to the knee that caused the original injury or an incision during surgery, inflammation occurs. 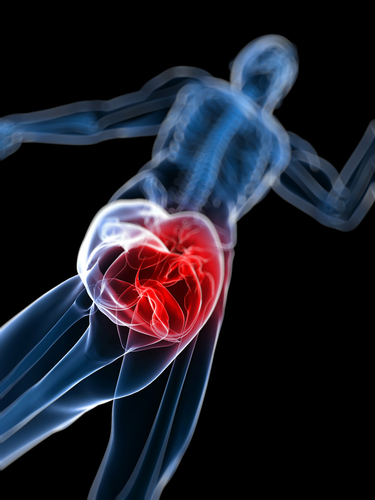 Although it can be uncomfortable, inflammation is actually not a bad thing. In fact, it is a necessary part of the healing process. As the tissues in your body begin to swell, they put pressure on the nerve endings in the surrounding tissue, resulting in pain. In order to make the healing process go as quickly and smoothly as possible, it is important to control inflammation, which subsequently reduces pain. After MCL surgery, your doctor will probably prescribe some combination of pain medications and anti-inflammatory drugs. Be sure to communicate with your doctor about any pain that you are feeling so they can manage it accordingly. Therapeutic cold at a consistent temperature actively removes heat from the injury. This causes a numbing effect and slows down cellular metabolism to help reduce secondary tissue that can contribute to continued inflammation. Active compression removes edema, or excess fluid, from the area to reduce swelling and the pressure on nerve endings that results in pain. This natural pumping effect also brings more oxygen to healing tissues so they can recover more quickly. The combination of active cold and compression allows the therapeutic cold to penetrate to deeper tissues and has a longer lasting effect than ice alone. Contact us to learn more about Game Ready's cold compression technology or to find a provider near you. The better you can be prepared before MCL surgery, the faster your recovery will be. Talk to your doctor about using cold compression therapy after surgery so you can reduce inflammation and recover with minimal pain. How prepared are you for your MCL surgery?